Hosting a Thanksgiving dinner for friends and family is a big deal but it doesn’t have to be super stressful. I’ve hosted for upwards of 16 of our family members for a holiday meal over the last 5 years and I have certainly learned a few things along the way. I’m not going to pretend that I never get stressed the day of but I’d like to think that each year it gets easier and I enjoy the event more and more. Because after all, as much as I want everyone to enjoy the food, it’s about the company anyway. Hope you enjoy my tips for how to host a stress free Thanksgiving, I promise it is possible! Do as much ahead of time as you can. Trust me on this one. Not to mention that many dishes taste better after the flavors have been allowed to meld, but you will not have as much time the day of as you think. Ask for help! When I hosted my first Thanksgiving, I didn’t really want anyone to bring a thing. I wanted to provide everything and not have my guests have to lift a finger. Well, that wasn’t very smart of me; first off, most people want to help contribute in some way and it will lighten your load (and your fridge space) in the days leading up. You can even ask someone who isn’t big on cooking to help you with dishes or cleanup instead (for me, dishes are just the worst. Luckily my mom and mother-in-law are always on the dishes so they never even pile up somehow). Set out dishes the night before. I always try to set the table and bring out all the serving dishes (and even label what will go in them) the night before. It helps me first make sure I don’t need someone to bring an extra bowl or platter plus it’s one less thing to do the day of. Make a schedule. You will be surprised just how many side dishes and other things will need the oven after the turkey is out. Make sure you plan accordingly so everything can come together sort of at the same time. It helps with stress as well – you have a concrete plan that you’re following and it allows you to easily give people the day of tasks that you need done as well. Make appetizers! This is a foolproof way to ensure your guests won’t be starving when your meal isn’t ready exactly when you were planning (that dang gravy just doesn’t thicken properly sometimes!!) Have a bunch of beverages out that people can help themselves so they’ll be satisfied and won’t even realize the meal is a little late. Realize it won’t always be perfect, won’t always be right on time. And that is perfectly ok. Give people a time you’re aiming for and do your best to hit it, but honestly they’ll be just fine waiting a little bit, especially since they’ve been snacking on your delicious apps and sipping cocktails or wine. Remember to enjoy the moment. Yes, you’ll have times where you’ll feel like you’re just sweating in the kitchen but remember to spend time with everyone who came and have a glass (or two) of wine or champagne. There you have it! 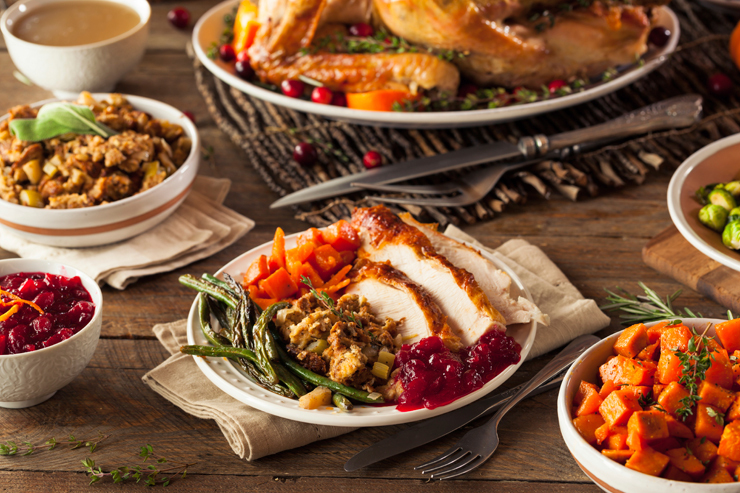 Hopefully these tips will help you host a stress free Thanksgiving (or any holiday meal really) this year.